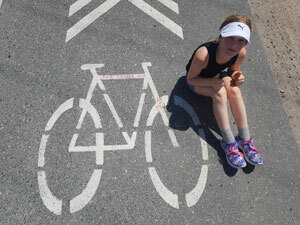 Dylan sitting by bike sign with a message from Susan – Bike Canada 2018 – AB to NFLD. 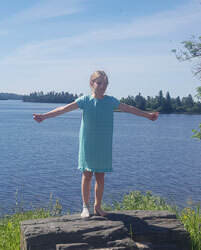 Nine-year-old Dylan Lefebvre has a wide array of things she loves to do, from figure skating to camping and from tubing to singing, Dylan is a girl who is open to trying lots of things. However, joining her dad Jimmy, mom Kristie, two brothers Kallyn and Kayden, and Meme (grandma) Rita on a walk across Canada to put an end to cancer has been something entirely new to her. Honestly, Dylan shared the sentiments that much of the rest of her family had about Jimmy’s idea to walk across Canada: Dylan thought her Dad’s idea was crazy. The journey for Dylan has had a few challenges here and there. Dylan walks with her family a little bit every day, through heat, rain, and wind. And to keep motivated while walking? Dylan’s absolute favourite musician, she mentions, is Taylor Swift. 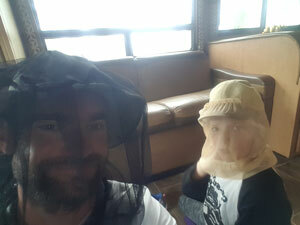 The Can-Survive Walk has been filled with adventures, including Dylan’s first visit to Ontario. Recently, the Lefebvre family took a day to go boating, which has been one of Dylan’s favourite days. Another one of her loves is swimming, and she’s quite imaginative, having fun playing with her brothers where they pretend to be mermaids and sharks. She’s very creative as well, inspired to create her own Inukshuks, based on ones that she’s seen along the walk. Dylan’s creativity, she also shares, has been going towards a good cause. With para-cord string, she’s been making bracelets, which she’s been selling to raise money for the Kids With Cancer Society. Dylan hopes that people who hear about the walk will keep donating to the cause. She’s looking forward to celebrating in PEI at the end of the walk and going to the Toronto Zoo, Hockey Hall of Fame and even Niagara Falls. As with the rest of her family, Dylan hopes the walk will inspire others. I think we can agree with Dylan, that with every uphill there’s a down. To support the Can-Survive Walk, visit our Donations page. Donations both big and small will go towards the L Foundation’s endowment fund. Thanks in advance for your support! To date, over $35,000 has been raised to eradicate this dreadful illness. According to the Canadian Cancer Society, over 80,000 people in Canada died from the disease in 2017.